Get down to business with a sturdy workbench from MonsterShop. Do more with a height adjustable, super easy to construct workbench, ideal for use in the home. Perfect for your garage, shed, warehouse, greenhouse or workshop, our workbenches can support an enormous 200kg of weight on both the top work surface and lower shelf. 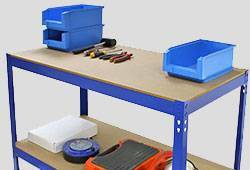 Comprised of robust steel combined with solid 9mm thick MDF boards for the work surface and lower shelf, our workbenches even have rubber feet to protect your floors and surfaces. Our boltless, keyhole mechanism makes assembly easy, so don’t worry about constructing your new workbench once it arrives - grab a rubber mallet and you’ll be up and running in no time.